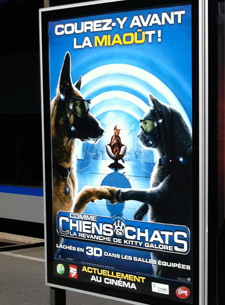 I promise I’ll shut up about it soon, but first here’s one more thing from my recent trip around Europe: a look at the posters for Cats & Dogs: The Revenge of Kitty Galore in four different languages. As you might expect, they’re mad punny. I was disappointed to translate this and find out that, strictly speaking, it doesn’t contain a pun. 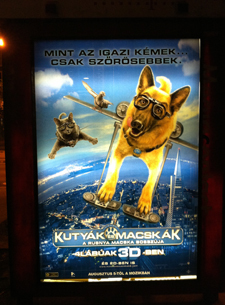 But as mind-numbingly banal taglines go, this is a real winner nonetheless. This one’s pretty good. And it’s interesting to find out that ‘purr’ in Czech is ‘prrr’. Presumably Czech cats have real trouble understanding everybody else at international meetings. 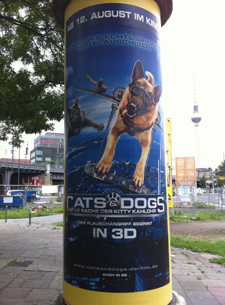 Although I suspect this may be the same tagline as the German poster, my inability to find a suitable translation for ‘szörösebbek’ gives me hope that there’s actually an intenesly clever pun buried in there somewhere. Give me a shout on Twitter if you can confirm this.